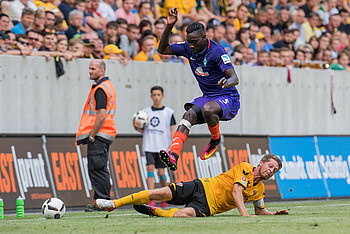 Sambou Yatabaré and SVW won a balanced game on penalties (photo: nordphoto). Line-up and formation: Viktor Skripnik utilised a 4-1-4-1 formation. Niklas Moisander, Theodor Gebre Selassie and Sambou Yatabaré retained their place in the staring XI, with Jaroslav Drobny, Janek Sternberg, Fallou Diagne, Thanos Petsos, Maximilian Eggestein, Florian Kainz and Lennart Thy completing the team. The game lacked rhythm but there was plenty of fight (photo: nordphoto). 12th minute: The first chance falls to Dynamo. A poor clearance sees the ball land at Erich Berko’s feet but his shot lacks conviction – a presentable opportunity wasted! 18th minute: Maximilian Eggestein bursts into the box after some clever interplay, but he can’t beat Marvin Schwäbe. Florian Kainz picks up the rebound but is unable to convert. 37th minute: Jaroslav Drobny makes his first save of the game. Andreas Lambertz is played through by a teammate but the summer signing is quick off his line and manages to get the ball before the attacker. Excellent keeping from Drobny! 45th minute: Goalless at the break. Both sides had a couple of chances but a fair score at this point. 46th Minute: Changes for both sides! Lukas Fröde, Leon Guwara and Izet Hajrovic reaplce Niklas Moisander, Theodor Gebre Selassie and Sambou Yatabaré for Werder, whereas only Schwäbe and Niklas Hauptmann appeared after the break for the hosts. 59th minute: Maximilian Eggestein strikes the post! The youngster picks up the ball after a corner and unleashes a powerful drive which crashes off the woodwork and bounces to safety. Best effort of the half to date – he couldn’t have gone much closer! Johannes Eggestein grabbed a late equaliser (photo: nordphoto). 67th minute: The woodwork strikes again! Florian Kainz fires an effort on goal after clever work from Izet Hajrovic but the frame of the goal comes to Dyanmo’s recue. 82nd minute: Stefan Kutschtke puts SGD in front. Kreuzer and Väyrynen hit Bremen on the break, leaving the forward with the relatively simple task of slotting past Drobny. 87th minute: Equaliser for Bremen! Johannes Eggestein grabs it! Hajrovic’s effort is too hot to handle and the forward gleefully slots home the rebound. Get in! 90th minute: The final whistle goes. It’s level, so we’re heading for a shootout. Penalties: Jaroslav Drobny kept out Marcel Hilßner and Niklas Kreuzer; J. Eggestein fired home the winner. Werder’s victory in this fixture means that Real Betis take the title. Summary: SV Werder sign off their Dresden Cup campaign with a victory. The draw at the end of normal time was a fair result, with training camp exertions catching up with Skripnik’s men.